1 February 2019: Greg Van Avermaet will line up for the first time in CCC Team colors next week when he opens his 2019 season by headlining the team’s Volta a la Comunitat Valenciana roster. 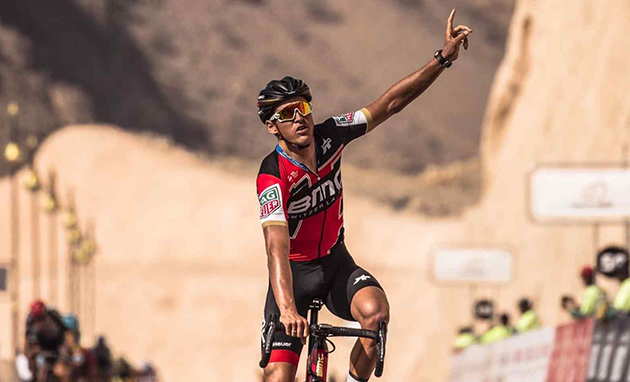 Greg van Avermaet (shown winning stage 3 of the 2018 Tour of Oman) will start his 2019 season at the Valencia Tour. Sports Director Piotr Wadecki said CCC Team will head to the start line of the five-day race with a strong team that will be targeting stage wins. “After the fantastic start for our team at the Santos Tour Down Under, we’re heading to our first race in Europe with a great group of riders around Greg Van Avermaet. Everyone is very motivated to get their season underway and we want to continue the team’s early success in Spain. The main objective for this race will be to go for stage wins before seeing what we can do on the General Classification. It would be good to be up there at the end of the five days,” Wadecki explained. Van Avermaet is looking to test his early season form at Volta a la Comunitat Valenciana as he did in both 2017 and 2018. “This race is a great way to kick off the season. It’s close to where we have our training camps and this last one leads perfectly into the race. This year there will be a lot of firsts for me here and that’s exciting. It will be the first time racing as CCC Team, the first time I race on my new Giant bike and in my Etxeondo clothing and finally, it will be the first time I race with some of my new teammates. There are some riders in this group who will play a part in my Classics campaign and as we are new to one another, it will be good to see how everyone reacts when we move from training together to racing together. I think it is important to have the confidence of all of the riders going into a race and before the Classics start it will be good to learn more about each other. This will be the perfect exercise for us all,” Van Avermaet said. Owain Doull led home a Team Sky 1-2 with Luke Rowe on stage three of the Herald Sun Tour to secure his first professional victory. Owain Doul and Luke Rowe win Herald Sun Tour stage thee in style. The pair were part of a nine-man break that led the bunch for the majority of the day, until the pair attacked their fellow escapees in the closing five kilometres. 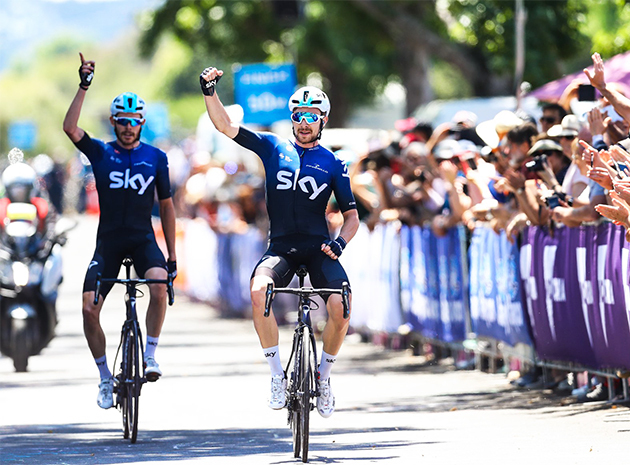 They were joined briefly by Nathan Elliott, but the Australian national rider was unable to match the pace of the Welsh duo and Rowe and Doull crossed the line, arms aloft to record Team Sky’s first win of the season. Kristoffer Halvorsen then sprinted for the line to secure 10th to make it three riders in the top 10 for a second successive stage and maintain Team Sky’s advantage atop the Best Team classification. There was no change in the general classification, with Kenny Elissonde third behind leader Michael Woods (Education First Pro Cycling) while Pavel Sivakov still tops the Best Young Rider standings. There's a moment in Netflix's Bandersnatch – Charlie Brooker's new ground-breaking interactive Black Mirror film – when the viewer has to decide whether the main protagonist, a programmer, hits his desk in frustration or destroys his computer. Choose the former, more balanced, option and the story continues; but pour tea or smash up the computer and, well, it's game over. Unsurprisingly. Judging by his actions this week, if Deceuninck-QuickStep manager Pat Lefevere were watching Bandersnatch, he'd clearly go down the route of computer smashing. Before this week, Iljo Keisse was probably best known for his dramatic stage win from the 2012 Tour of Turkey, which he won despite crashing on the final corner, or for his peloton-defying victory on the final day of the Giro d'Italia three years later. That or the positive doping test he returned during the 2008 Six Days of Ghent which resulted in a prolonged legal battle to clear his name. But on Saturday, Keisse took the eceunn out of Deceuninck with his crude contribution to the Time's Up movement. Following in the footsteps of Peter 'Bottom Pinch' Sagan and Jan 'Condoms for the Podium Hostesses' Bakelants, Keisse added a resounding Me Too by feigning a sexual act behind a waitress as she leaned forward while posing for a photograph with his Deceuninck-QuickStep team – the self-styled Wolfpack – in San Juan. After the 18-year-old woman lodged an official complaint, 36-year-old Keisse was spoken to by the police and fined £60. He then made one of those apology of sorts ("to everybody who feels offended by what I did") in which he admitted his mistake, promised it would never happen again, but stressed that he had no disrespectful bone in his body. "@IljoKeisse: I want to apologize to everybody for the gesture during a photo taken this week. I didn’t want to offend anybody and I deeply regret it. I know I’ve made a mistake but I’m not a disrespectful person. I’m really sorry. " As if offering some kind of condonation, Keisse also strenuously denied that he made any contact with the waitress, while doing his level best to make it out that he was a victim, too. "I made a mistake. I made a stupid movement with my hand. I did not hurt anybody – yes, the feelings – but I'm not a thief, I'm not a criminal. I'm human, I made a mistake. I came all the way to Argentina to do this Vuelta a San Juan. I really regret what I did but I'm here to race and I'd like to continue doing that." In his extended apology, Keisse seemed to infer that his actions were mitigated by the fact that he and his team-mates didn't, er, steal their coffees and, in fact, even "gave the waitress a tip". He also threw in the aside that he and the Wolfpack graciously pose for "1,500 [photos] every day" – again, as if to suggest that they were doing the waitress a service by putting her in a position where she could be ridiculed. Keisse's statement concluded with the concession that his actions had made things "not easy for this lady". But he then stressed that it was also "not easy for me or my wife or my children or my family at home". You can read the entire story here.